It’s stop number 12 on the Crime Fiction Alphabet Express. If you are unfamiliar with CFA, it is a challenge run by Kerrie over at Mysteries in Paradise, so head on there and sign up, or click on some links and read what others have to say. This is my second time on this Loop-de-loop and I have chosen to focus on topics related to crime fiction rather than books and/or authors. 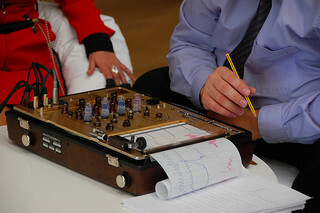 A lie detector or Polygraph is commonly used in investigative work to ascertain whether the subject is being truthful. The detector measures several physiological metrics including heart rate, skin conductivity and blood pressure and uses the results to classify answers as either lies or truths. Since bodily responses are different for every individual, the results are calibrated using questions whose answers are known – such as “What is your name?” “Have you ever resided in <insert city/town here>?” “Were you born in 19xx?” etc. These questions help decide a baseline for the body’s response to questions. Significant deviations from this baseline are used as evidence for lying. The polygraph was invented in 1921 by John Augustus Larson, a medical student at the University of California at Berkeley and a police officer of the Berkeley Police Department in Berkeley, California. Since then it has become a common tool in interrogation rooms worldwide. However, the usefulness of lie detector tests are highly debated in the scientific community. Multiple studies, including some by popular tv show hosts like The Mythbusters and Penn & Teller, have shown how the results of such tests can be manipulated by someone who is trained to fool these machines. In the U. S., the admissibility of the results of a polygraph test is left to the local jurisdiction and to the trial judge in a federal court. The Canadian Supreme Court has ruled against the admissibility of evidence from such tests though the continue to be used as an investigative tool. The debate over the use of such techniques is only going to get more complex and more muddled with the increasing use of more sophisticated technologies such functional Magnetic Resonance Imaging (fMRI). We already have brain scanners that can do a very rudimentary form of mind reading, including detecting what objects you are thinking of and the emotions you are feeling. It will be interesting to see how the Fifth Amendment holds up against these new technologies. Very interesting. I did know that the results of lie detector tests can be questionable. But I did not know that it was invented in Berkeley, California. Or that it had been around since 1921. I think polygraph tests are generally reliable. As a defence counsel I have a problem with Canadian police testers who, when they get a fail, then work on the accused to seek a confession. Bill, sadly that’s true in most every police department I think.